Responsive Flexible WordPress Theme | Flare is great for any business website; hundreds of elements styles have been developed to help you to create any business website within mins. Responsive, fast, RTL support, created with a deep down research to actual business requirement, feature packed & supported by RubikThemes Elite Author. 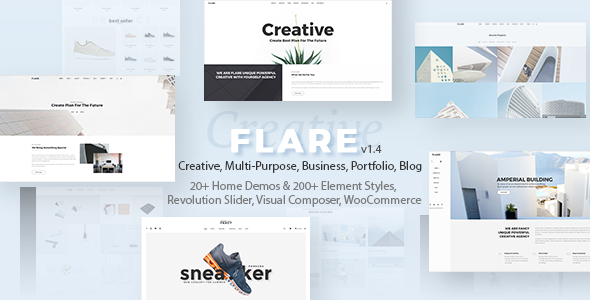 Flare | Flexible Multipurpose Business WordPress Theme gives you the power of the complete control of any online store or ecommerce website with WooCommerce – the most influential eCommerce system available so far. WooCommerce comes bundled with the ability to pay through variable gateways as well as manage stock, products and inventory. With our optimized Oneclick Demo Importer & 3rd party dummy data import, you can get the same as our live demo within clicks. We believe speed should be at its best in order to keep visitors staying longer. We created the optimization setting to minify, cache CSS, JS, HTML. You don’t need to install such plugins to make your site load faster. Just turn it on with 1 click in our Theme option. You can configuge to use different colors & images for any pages via page option or theme option. We provide a lot of usepful & powerful post types such as team, sermons, events, …so you can create your pages as you want & need in mins. Tested & compatible with polylang & WPML. Bundled with our SLZ Core Plugin, a powerful plugins with hundreds of settings & premades. We built a light megamenu inside of our SLZ Core so you don’t need to install a heavy 3rd party plugins to achieve that feature. To setup and using the theme, Importer function will help you import demo data with just 1 click. The theme has many options with drag & drop display. It makes your customization become simple, easy and excited. With color picker in admin panel, you can make your site more dynamic. You can choose a color from popup with one click or paste your code into field. For page title, you can upload background image, customise spacing. Beside it, you can control all components in page title such as the title, the subtitle, breadcrumb. There are many positions to display the sidebar. Just choose left, right or none to make your site have the best view. You can chooose to upload your own logo via our powerful theme option. This theme has option to configuge font for typography element. You can choose font family, color, font size, align, etc? If you want to make own customization, you can put your code in this option area. We prepared in advance a beautiful editor for you, let enjoy it! You can use the online booking system via WooCommerce easily. Many more features are coming, so please stay tuned! Hope this theme is helpful for you. If you like this theme, please rate it. Thank you! Note! Images in demo link are for preview purposes only & NOT included in purchased package file.